It’s true: I sold my soul to the devil to build epic LEGO creations. 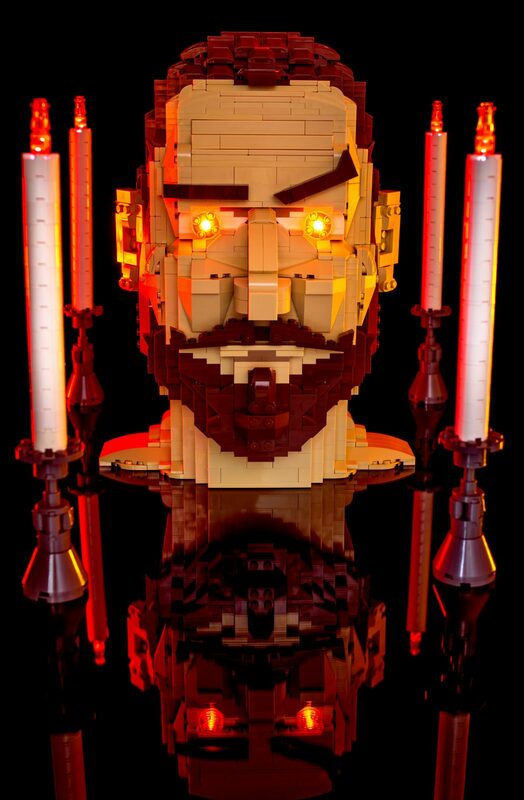 I used orange irises for my head sculpture, then surrounded it with functional LEGO candles. The candles were made by me in the last weeks of October, and function via button cells and a flickering LED. The scene is taken atop a pane of glass with a dark background. When shooting this photo, I experimented with a fog machine for the first time. I took a round of pictures without the fog machine, then shot several more with a smoky background. Unfortunately it didn’t turn out as anticipated, and made the scene appear cloudy and distorted. I ultimately used the first round of photos without the fog effects. The reflection of the demonic eyes in the glass was actually accidental, and was taken in the last few shots of round 1. The first few shots had the tripod looking upwards at the face, where the eyes weren’t reflected on the glass. When I was about to wrap shooting, I bumped into the tripod and moved the camera out of place — at an angle which showed both glowing eyes reflecting menacing on the surface.